The other day my husband noticed me writing down my mileage for the day in my planner. He commented that he thought I was done logging miles for the year. It is true that last year I decided to track my mileage to see just where I would end up by the New Year but I gained a lot of insight from that information. Keeping a training log can provide plenty of information about your running and your body. Last year when I ended up sidelined with a serious bout of Achilles Tendonitis I spent the first week dumbfounded about what had happened to me. Then I sat down and looked at my miles and at first I still couldn’t figure out what was going on. I had been running the same mileage since the New Year and there was even a slight dip in my miles around the time I got injured. But by looking at that info I realized it was around the same time I had purchased a new pair of shoes. I didn’t actually write down my new shoe purchase but by seeing all of the data right there I was able to establish a timeline for what had happened. 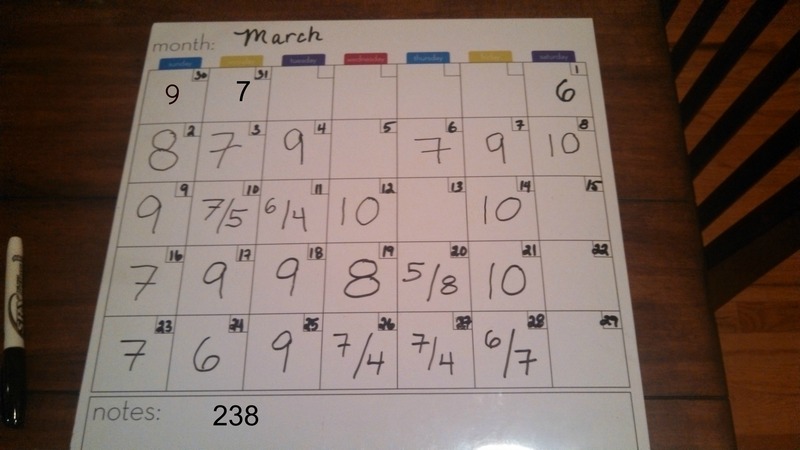 Over the summer my husband was training for the Chicago Marathon and while he personally wasn’t tracking his mileage he was following a plan and I was logging the miles for both of us. This training session he seemed to be struggling with little nagging issues that were enough to force him to take frustrating breaks from his training. He was playing it smart but he couldn’t figure out what the heck was going on. Then at mile 18 of the marathon, as he was cruising toward a PR finish time, his hip flexor suddenly gave out. Being the champion that he was he pushed himself to walk to the finish line. The most frustrating part of this? He had never dealt with any hip flexor issues on a run ever. After a hiatus from running and once his hip flexor was ready to cooperate we sat down and discussed his training and reflected on the summer. The mileage was not the issue. In fact, given his breaks due to injury, he ran less mileage than other training rounds. By looking at what he had done over the past year we were able to determine that he really needed to focus on strengthening his lower body. Over the next few months he started doing daily exercises specific to his running and he is now running stronger than he was before! Keeping even the most basic training log can be a major help in determining what works and what doesn’t work specifically for you. It can be as simple as jotting your miles each day in your planner (this is how I roll) and adding up monthly mileage. Or you can take it a step further and make it more detailed. Write down each training session including yoga, cross training, and weight workouts. Keep notes on how you are feeling or how your pace progresses. This information acts like your very own running coach. It can do the detective work to keep you on track (pun intended). Speaking from experience this requires very little time on your end. But the insight you will gain and the chance to avoid nagging injuries makes it well worth the effort! This is such a great tip! When I seemed to get plantar fasciitis out of “nowhere” this past summer, looking back at my calendar I realized it came on just about 2 weeks after I’d started adding speed intervals… which came about two weeks after adding hill workouts. “Too much too soon” does not just apply to mileage! And if I hadn’t tracked it I may not have put it all together. That is so true. When I got plantar I said the same thing, “Out of nowhere!” But I was logging 10 mile runs 6 days a week and sometimes more. My body at the time wasn’t ready to handle it. Had I been writing it down I might have noticed earlier. This is smart!! I use Strava to record everything, but I think a more detailed log is a great idea. Strava is a great tool. And if you use it regularly it is so nice to be able to rely on it. I even use my Jawbone now to look back at times. Whatever works! This can really help. I usually just use my Nike+ app to track all my runs, but I know writing it down and making notes would also help me see patters and such. Keep up the good work! I love that you can also use the Nike+ App and others for this as well. It is nice that there are options. I log my miles/pace online, and agree it really helps!! So glad to hear. It can make a huge difference for many people. i just use Map my Run but have never actually paid attention to logging my training or reflecting upon it…i definitely agree that cross and strength training have helped me so much with my running, though, so it’d prob benefit me to keep a more regular journal of what i do each day and write a little about how i feel and see my progress. good tips. You are always good about your cross training. Maybe as you continue to increase your mileage or use training plans you will find that logging the mileage will be helpful. I’m a big fan of tracking my mileage and little notes on the side (how the run went, inside/outside, what shoes I wore etc). This I totally understand! Type A runners unite! I use Nike+ to track my overall miles and miles on my shoes. I am trying to keep a log on a planner now too. That way I have just a little more info to look back on. I just have trouble following through! I totally understand. It’s always these simple things that take little time (like me and foam rolling) that we slack on but easily spend lots of time with the consuming stuff! I’ve kept a running log for years now. You’re right, it’s a great tool to have to look back on. Great work sticking with it. I am sure you have learned a lot about yourself and your running. Absolutely agree that a training log is essential. Not only does it keep you accountable, but it helps you to see where there may be lapses in your training (like you found out). I log most of mine on Daily Mile, although I am sure a paper copy would probably be better since things in the Interwebs can be forgotten! Love it. Thanks for sharing. I am going to check it out! I’m old school too. Everything (and I mean every workout) gets written into my calendar. I find it really helpful and weirdly satisfying to fill in everyday. I am so with you on this. It is strangely satisfying! I totally understand. You should see my planner. I rely on it for everything. I love the idea of your training app.